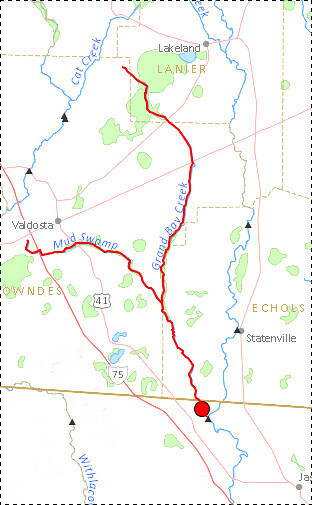 Update 3 March 2016: Suwannee River, ten rivers, and current location of USGS streamer. 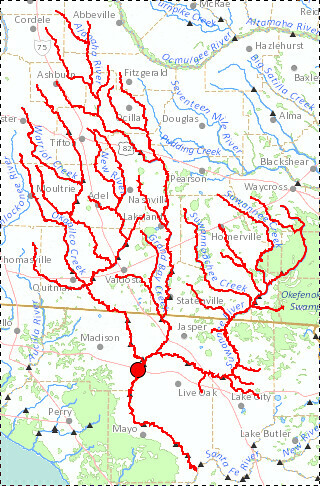 The USGS Streamer interactive map shows all (well, most) tributaries of our two biggest WWALS rivers. Visitors sometimes refer to our “four rivers” since we only originally named four in our WWALS mission: Withlacoochee, Willacoochee, Alapaha, and Little. Yet we added the upper Suwannee, and there always were more than that: from one to ten rivers, depending on how you count them. 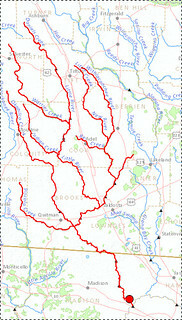 The Withlacoochee River tributary map here shows the New River south of Tifton joining the Withlacoochee between Nashville and Adel. 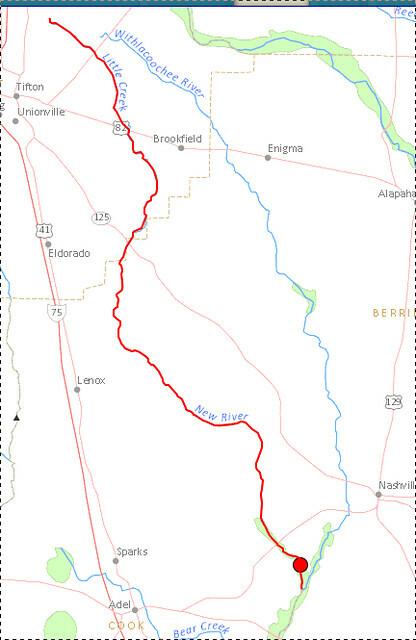 Streamer never names the Alapahoochee River, which runs from the junction of Mud Swamp Creek and Grand Bay Creek about 14 miles to the Alapaha River. And it doesn’t name the Dead River into which the Alapaha often flows backwards into a sinkhole. Streamer does name the Little Alapaha River, but doesn’t show a trace for it, although it does appear in EPA MyWaters Mapper. 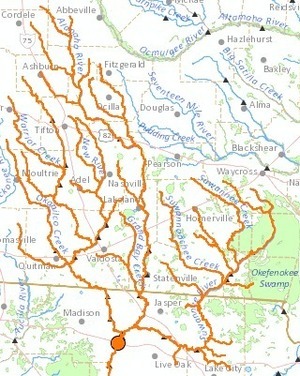 The Upper Suwannee Hydrologic Unit Code (HUC) includes, in addition to the Black River that runs into the west half of the Okefenokee Swamp, all the creeks that cross US 84 from there west: Big Alligator Creek, Little Alligator Creek, Greasy Branch, Suwannee Creek, Little Suwannee Creek, Box Creek in Argyll, Peters Branch, Cane Creek, Woodyard Creek in Homerville, and Suwannoochee Creek at DuPont. Also in Georgia, Tatum Creek, Toms Creek, and Cypress Creek. In Florida, Deep Creek, Falling Creek, Rocky Creek, Pinhook Swamp, and doubtless many other creeks, swamps, and bays in both states. The upper Suwannee, standing also for all its tributaries. 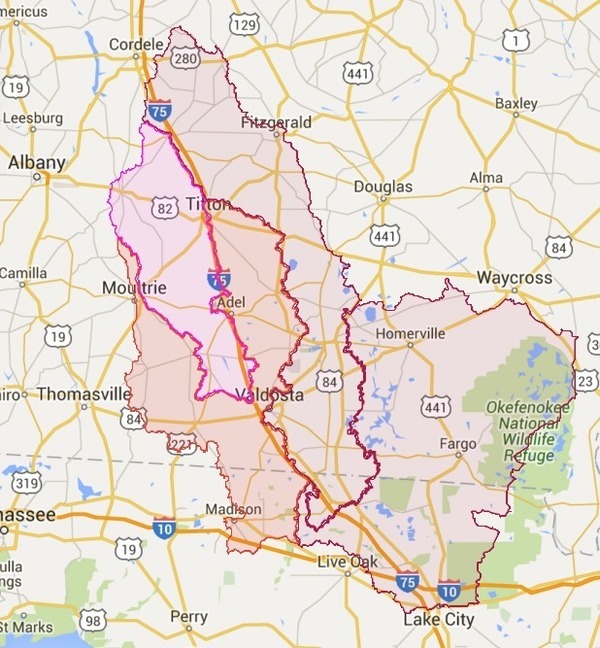 The three biggest rivers, the Suwannee, Withlacoochee, and Alapaha. The four rivers originally named, Willacoochee flowing into Alapaha, and Little flowing into Withlacoochee, but now we must count Suwannee. 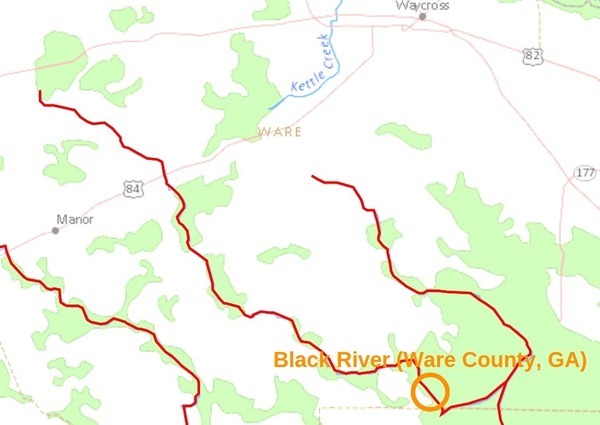 Black River like Withlacoochee and Alapaha flowing into the Suwannee River, which eventually makes its way to the Gulf of Mexico. At some points in history, Okapilco Creek has been called a river. And our New River is not to be confused with Florida’s New River, which flows in to the Santa Fe River, and thence into the Suwannee River. Plus even though our Withlacoochee River flows into Florida, Florida has another Withlacoochee River starting north of Tampa that flows directly into the Gulf of Mexico. That one was apparently named after our Withlacoochee River, which Florida calls the Withlacoochee River (North). 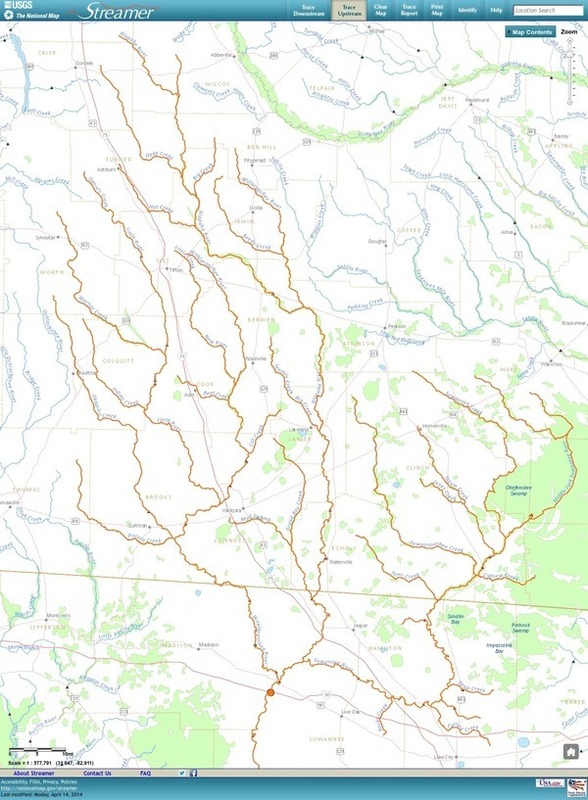 Anyway, our WWALS watersheds include one to ten rivers, depending on how you count them, and many more creeks, swamps, seepage slopes, and the uplands that drain into them. Anything that runs downhill is likely to end up in one of our rivers. Or anything that paddles, which often includes us. Come join us! 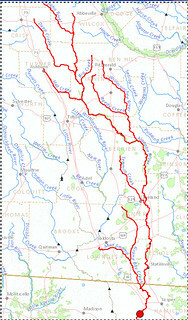 This entry was posted in Maps, River and tagged Alapaha River, Alapahoochee River, Black River, conservation, Dead River, Georgia, John S. Quarterman, Little Alapaha River, Little River, Lowndes County, Maps, NationalAtlas.gov, New River, north Florida, Okapilco Creek, Piscola Creek, river, south Georgia, Streamer, Suwannee River, USGS, watershed, Willacoochee River, Withlacoochee River, WWALS, WWALS Watershed Coalition on July 21, 2013 by jsq.